Learn to avoid the worst casino bets by house edge. I’ve always been an advocate of playing casino games that you truly enjoy. Online or on land, no casino is in the business of making every player a winner. Therefore entertainment should always be the number one goal. But as we can all agree, winning sure makes the experience a lot more entertaining! Sic bo, for instance, can present a house edge as high as 40%. Ouch! But sic bo is more of an Asian-market favorite. You won’t find it at every gambling hall, especially at casinos in North America. This list will focus on major games found in almost every casino across the globe. Stay tuned for our next segment, where we’ll discuss the 10 Best Casino Bets by House Edge. The average house edge for keno bets is 25%, making it the worst gambling option available at casinos. The only positive thing about keno, if played in a land-based casino, is the slow pace of the game. With numbers drawn once per hour, you’ll only (theoretically) lose $0.25 per hour for every $1 bet. The ‘Any Sevens’ bet in craps has a terrible house edge of 16.67%. It’s a single-roll wager that the next roll will be any seven. Only three rolls can produce this (1+6, 2+5, 3+4). If you bet $1 per roll, you could easily lose $20 in an hour. Slot machines are one of the most entertaining games to play. Walk into any casino, and just look at all the people who occupy their seats. In general, these games aren’t the worst to play, but those with progressive jackpots are. At land-based casinos, their house edge can range from 12-17%. Even online, where most slots pay better, the progressive ones are usually set at 11-12%. Add in the fast pace at which most players spin the reels, and with a $1 bet, you could drop anywhere from $200-$400 an hour on these games. Never, ever, bet on a Tie in baccarat. It has a horrible 14.36% house edge. Stick to the Banker (1.06%) or Player (1.24%) bets only. Betting on snake eyes or boxcars in craps is almost as bad betting on any sevens. There’s only two possible ways to roll these (1+1, 6+6). Ignore the lofty payout, it’s not worth it. Here’s another terrible craps bet. The Whirl, or World bet, is a single roll bet that a 2, 3, 7, 11 or 12 will roll. Avoid this 13.33% house edge. The horn bet is a single roll craps bet on 2, 3, 11 or 12. It’s another bad bet with a 12.5% house edge. Here’s some more ‘crappy’ wagers in craps. The ‘3 and 11’, Hard 4 (2+2) and Hard 10 (5+5) bets all have an 11.11% house edge. The 1¢ and 5¢ slot machines at land-based casinos are almost as bad as progressives, carrying an average house edge of 10-12%. The general rule here is, the cheaper the slot, the more you should avoid it. This applies to land-based casinos only. Online casinos tend to offer better odds on these slots, averaging 4-6%. And finally, craps strikes again with the Hard 6 (3+3) and Hard 8 (4+4) bets These have a 9.09% house edge. You may be recognizing a pattern by now. Craps clearly has more of the worst casino bets (by house edge) than any other game, claiming 6 spots on our top 10 list. That doesn’t mean craps is a bad choice. Just be careful where you place your bets! Royal Vegas Canada is Canadian friendly, a legitimate brand and operator that has been our editorial pick for back to back years. Highly recommended for prospective Canadian gamblers. 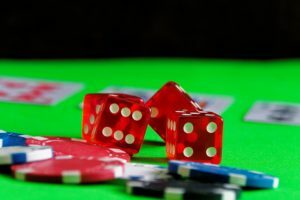 Are Mobile Casinos Games really Similar to Land-Based? Royal Vegas Canada Copyright © 2019. Theme by MyThemeShop.